Weight Loss Help: Who Should You Trust? If you've ever tried a diet that didn't work you found out one of the disappointing truths about weight loss: You can't believe everything you hear. So what should you do? The place to start is to make some rules for yourself. Rules? Sure, nothing complicated, but you ought to have a way to judge the advice you're getting. Does what they say make real sense? "You can't lead anyone else further than you have gone yourself." How about recommendations from a bodybuilder? They have those beautiful muscles, right? So you could follow what they say. The problem with that is that most bodybuilders are genetically gifted. And most bodybuilders never had a real weight problem. You, on the other hand, are probably not genetically gifted and you do need to lose weight. And you can't bench press 600 pounds. You could follow what the scientists tell you. These are the guys doing the research. They should know what they are talking about. Be careful with this one. Science is a funny thing. A lot of the time a scientist goes into the lab with an idea. And then he doesn't come out until he proves that his idea is right. That's where science falls apart. 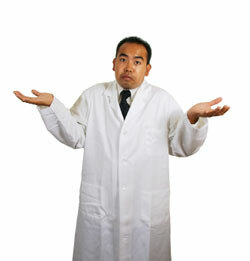 See, scientists and researchers are human and they are influenced by their own ideas and beliefs and prejudices. They can also be influenced by whomever pays their salary, or by the generally accepted beliefs of society, right or wrong. It can make them biased. That's why -- if you really look carefully -- you'll find that most published scientific studies are false. So keep your eyes open. "Act as if what you do makes a difference. It does." How about the "diet gurus." These are the ones you see in the fancy ads and TV shows. They show the models with glistening bodies and effortless success. Nothing wrong with glistening bodies. And some programs are successful. But look at the fine print, where it says, "Results not typical." Not typical? Sure, another way of saying it won't be as fast and easy for you. The sad truth is that many marketers will say whatever they have to say in order to get you to buy. The profit motive is too strong. Nothing wrong with making money. If you have a good product you deserve to make money. And if you don't make money you're out of business, and then no one will benefit from your product. But that's only if you have a good product. If not, then it's all a sales pitch. And you lose. For real help you want something practical. The focus should be on long term weight loss. Don't jump at a program that overly promotes "fast" or "easy" weight loss help. Those are red flags. And if there's no exercise required? Well, it's not impossible to lose weight without exercise, but it's a lot harder and the results are just not as good. Did they lose weight themselves? This can actually be very helpful. If someone overcame their own weight problem then they know what you're going through. They know it isn't easy and won't happen overnight. They are less likely to have a program that is great in theory but not in real life. And if they kept the weight off, then whatever they are doing works for long-term weight loss. It may be worth a closer look. If you want a workable program for weight loss, if you want to lose weight and keep it off, you should get a copy of Dr. Dan's Super Weight Loss Plan. If you follow it, you can finally lose those extra pounds and keep them off. You'll be glad you did.